With Valentine's Day fast approaching, why not enter our Dirty Derby Weekend competition? All you have to do is tell us in 25 words or less why you and your loved one/s deserves a Dirty Derby Weekend. Not good with words? No worries, put together a couple of photos that shows why you need the weekend away. Photos need to be able to be published with a G rating please! NOTE - Winners agree when taking prize packs that they are willing to provide RideTassie.com with between 20 to 30 photos of their Dirty Derby Weekend, so they can be used for marketing purposes by supporting businesses. Winners chosen by 9.30 pm 13 Feb 2015 and announced there after on https://www.facebook.com/pages/Ride-Blue-Derby-Official-Site/728042770620821 and via email. Open to Australian residents only and must be over 18 years of age. Term and Conditions at this link. By entering the competition you agree to having read and understand these terms & conditions. Prizes - Winners will pick prize package they want, as they remain. http://www.tindragontrailcottages.com.au/ Thanks Graham & Christine! 1 x Spa Pamper Pack (donated by tassietrails.org) Thanks John! 1 x $50 fuel voucher (donated by RideTassie.com) Thanks Damo! Food / drinks voucher to value of $50 for Imperial Hotel, Branxholm. Thanks Peter! 1 night's accommodation @ Branxholm Lodge for up to ﻿6 mates / lovers﻿. http://www.branxholmlodge.com/ Thanks Sarah & Jason! Food voucher to value of $50 from IGA Supermarket, Branxholm (perfect for a BBQ Pack!) Thanks Frank! 1 night's accommodation for 2 @ Cascade Cottage, Derby. http://www.cascadecottage.com.au/ Thanks Garry & Virginia! 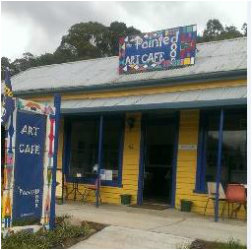 1 x daytime dining voucher @ Derby's Painted Art Cafe. Valued at $40. Thanks Mandy & Vicki! 1 x Bath Pamper Pack (donated by tassietrails.org) Thanks John! 1 X $50 over-the-bar drinks brochure at Federal Tavern, Derby. Thanks Virginia! Prize must be taken over the next 12 months and need to be taken as a package. Individual prizes within prize packages cannot be taken separately. As accommodation providers have more beds available, you can bring more mates / lovers, but these will be charged at normal nightly rates.